I usually can tell a Cooper’s hawk from red-tailed hawks from the chest — the adult Cooper’s has almost a salmony-colored chest and a long striped tail, and the adult red-tailed hawks have that belly band under a white chest and the red tail. 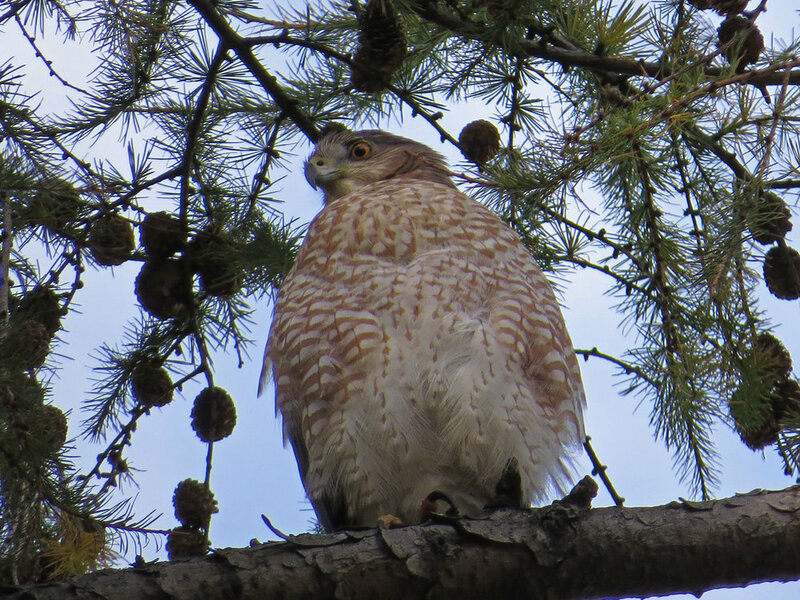 The young Cooper’s hawks have dark feathers on the chest, but they go all the way down and the tail is thinner and longer than a young red-tailed hawk’s tail. When it comes to differentiating Cooper’s hawks from sharp-shinned hawks, though, I’m not as good. 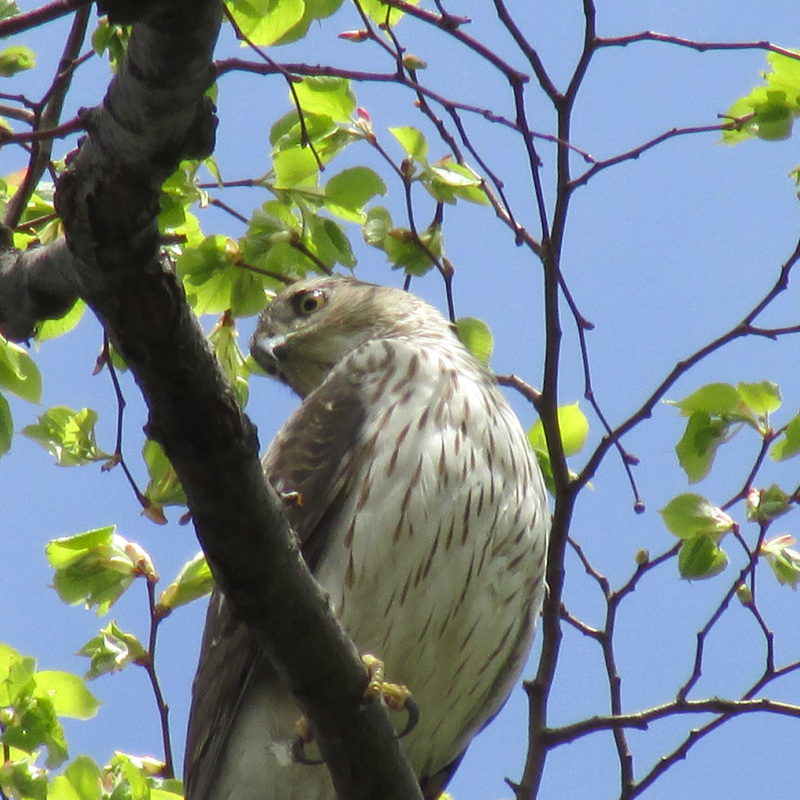 We agreed that this young hawk we watched on March 22, 2019, at the feeders in Central Park was a young Cooper’s hawk — from the tail and the yellow eyes, and from listening to better birders than I am! I took out most of the talking around me when I filmed the Chasing the Hawks in Central Park video, and left in some of the wind sound and bird sounds. Often when a Cooper’s hawk is this close to the feeders, the other birds disappear. But either the little birds forgot he was there, or were too hungry to avoid the area. All of the photos in the group below were taken March 22, 2019, near the feeders in Central Park. A Cooper's hawk over the Oven on Jan. 31, 2017. In Part 10 of the Hawky New Year! series. 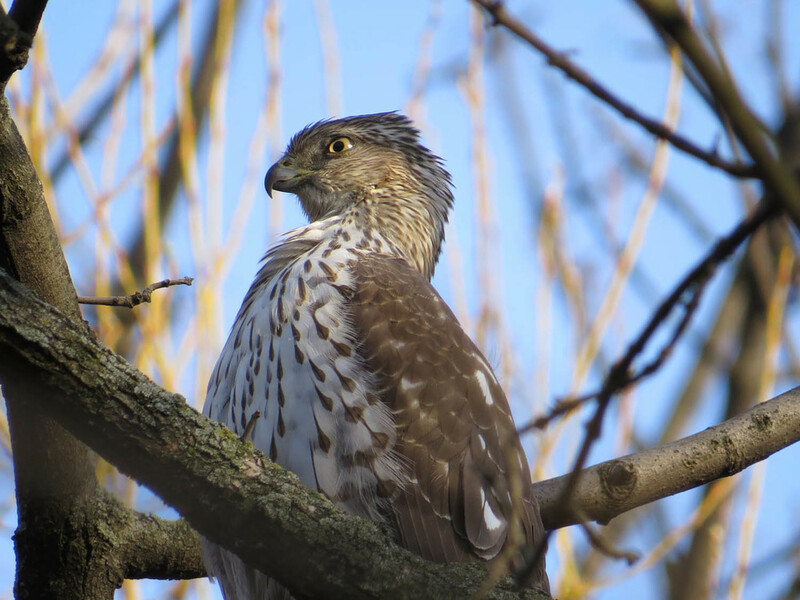 Two Cooper's hawks were hanging out in Central Park in November 2016, one an adult and one a youngster. One has been seen most often in Strawberry Fields, the other most often on the east side of the Ramble. I included them in the Four Days, Six Raptors video, and I include photos below. March 11, 2016. 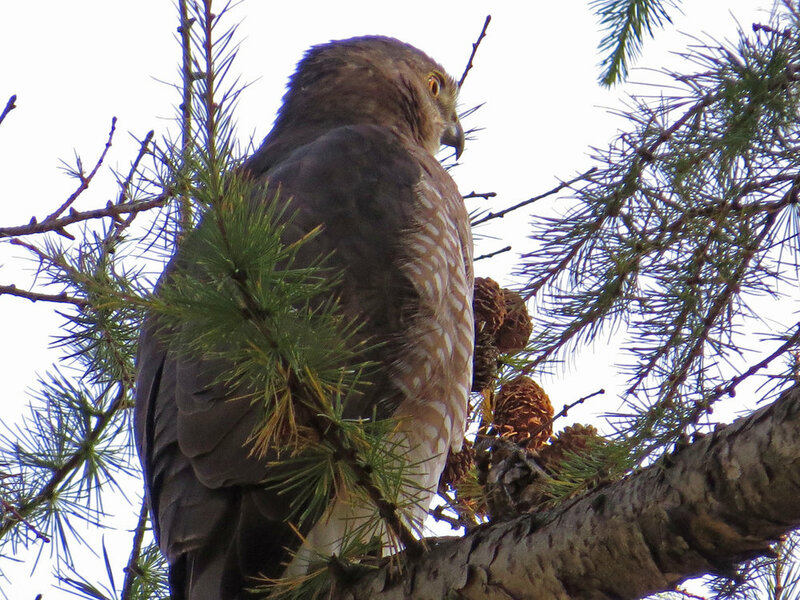 Looking up while walking near the Loch in the North Woods, we spot a Cooper's hawk in a tree. March 23: another walk, another glimpse of the Cooper's hawk, bathing in the water. 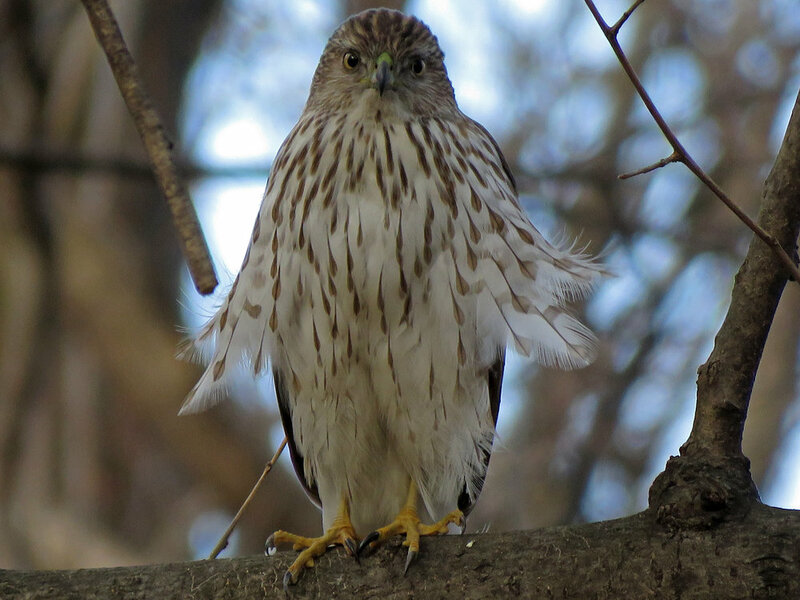 This Cooper's hawk was seen in the Ramble on Nov. 16, 2015. 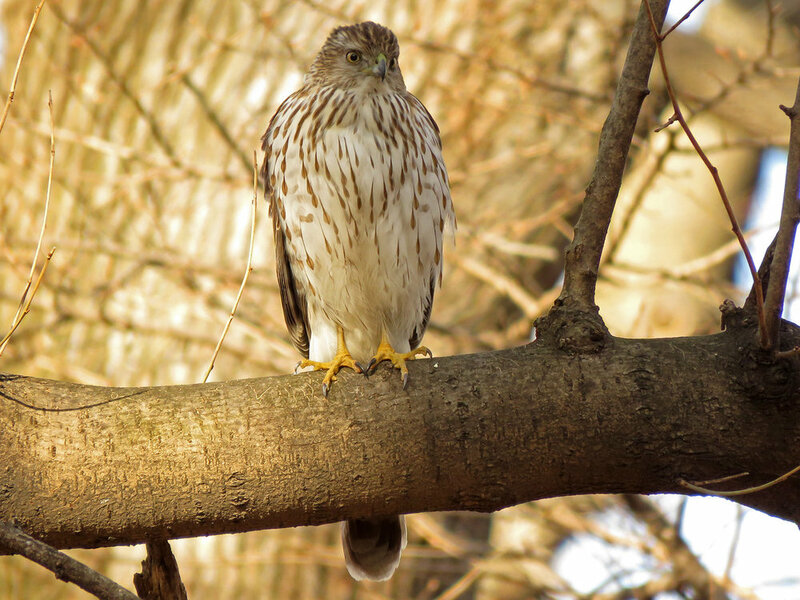 And this Cooper's hawk was photographed on Feb. 10, 2016.